Single-payer health care, according to presidential candidate Hillary Clinton “will never, ever come to pass.” With that sort of wet blanket approach during campaign season, it’s no wonder Sanders’ support has surged. But it’s what we’ve come to expect from Clinton; whether it’s a $15 an hour minimum wage or free college tuition, we’re told bold measures to improve working people’s lives just aren’t feasible. With rising premiums and out-of-pocket costs, voters in both major parties want to know what candidates plan to do to reduce health care costs (Reuters, 12/21/2015). But despite the establishment economists deriding Sanders’ plan as “puppies and rainbows,” multiple studies have shown single-payer health care – also called expanded Medicare, or Medicare for All – is the only strategy to curb growth in health care costs while improving patient outcomes. Unsurprisingly, Bernie Sanders’ call for single-payer health care has come under fierce attack from the Clinton campaign. Yet Clinton leads all presidential candidates – both Democrat and Republican – in money received from drug companies, so her opposition to single-payer is unsurprising (CNN, 2/11/2016). From her time as a U.S. Senator from New York up to her current bid for president, Clinton has received roughly $13.2 million from sources in the health sector, according to data compiled by the nonpartisan Center for Responsive Politics (International Business Times, 1/13/2016). She talks tough about characters like “pharma bro” Martin Shkreli – the former hedge fund manager who jacked up the price of a life-saving medicine by 5,000% – but based on their campaign donations, pharmaceutical companies don’t see her as a threat to their profits. Clinton has made wildly exaggerated claims about the cost of a single-payer system. But drastically reducing administrative costs by closing insurance companies and eliminating their profit is one of the strategies to fund the system. As Dr. Steffie Woolhandler, professor in public health at City University of New York and co-founder of Physicians for a National Health Program, recently stated, “It’s indisputable that single-payer systems in other countries cover everyone for virtually everything, and at a much lower cost than our health care system. Experience in countries with single-payer systems, such as Canada, Scotland, and Taiwan, proves that we can have more, better and cheaper care” (Accuracy.org, 2/12/2016). She stated, “If the U.S. moved to a single-payer system as efficient as Canada’s, we’d save $430 billion on useless paperwork and insurance companies’ outrageous profits, more than enough to cover the 31 million Americans who remain uninsured, and to eliminate co-payments and deductibles for everyone” (Accuracy.org, 20/12/2016). The Clinton campaign has shown no shame in its attacks on Sanders’ health care plan, relying on half-truths, saying Sanders would eliminate Medicaid, Medicare, and the Veterans’ Administration as well as the Children’s Health Insurance Plan (CHIP). On the contrary, under Sanders’ plan these programs would not only be preserved but consolidated into one single-payer program, yielding millions of dollars in efficiencies. While Obamacare did increase the number of people with health insurance, a welcome gain for many, it left the for-profit health care system intact. And, still, 29 million remain without any coverage at all, and 31 million are underinsured, meaning they can’t afford to go to the doctor or fill their prescriptions (CommonWealthFund.org, 5/20/15). Over half of people with medical debt actually have health insurance. Obamacare has insured more people, but it continues to subordinate patients’ needs to profit. By shifting more of the costs of care onto people, health care is prohibitively expensive for many and has allowed the health insurance industry to pull in tremendous profits (PNHP.org, 9/16/15). A single-payer system would eliminate all the various insurance companies, resulting in an expanded Medicare system, which would be the single payer. The savings afforded to the U.S. economy from this process would allow for those people employed by insurance giants to be rehired in other areas. Most importantly, it would guarantee everyone health care. No qualification exams, no limitations – nothing. Everyone is covered. Also, no out-of-pocket expenses, no unexpected health care bills, and no curbs on access to essential treatments. No wonder Sanders is tapping into a broad swath of support though his determination to fight for single payer. Clinton’s final answer has been that Sanders won’t be able to get anything done because Republicans control Congress. Based on that argument, nothing would ever change. Yet is has, repeatedly. That’s because changes that benefit the 99% don’t come from establishment politicians. From the eight-hour day to Social Security, from the gains of the Civil Rights Movement to ending the Vietnam War – and, most recently, winning marriage equality – these victories came as a result of public anger and powerful social movements that changed the political landscape and forced politicians of all stripes to respond or be replaced. If working people organize to demand single-payer health care, then we can win it – along with many of Sanders’ other demands. That’s what Sanders means when he says we need a political revolution. He’s opening up a discussion about what working people really need, not what they should settle for based on “what’s feasible.” It’s this discussion that’s behind his momentum, and it’s what scares the hell out of the political establishment. The Sanders campaign has brought the issue of a single-payer back onto the political agenda. He’s also given voice to the anger of the 99% at Wall Street, and that’s why Socialist Alternative calls for a tax on the super-rich and corporations to provide high-quality health care for everyone. 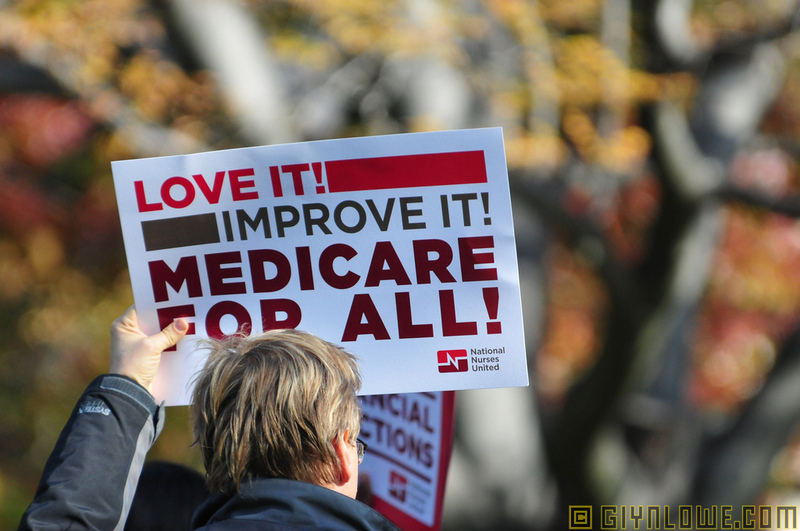 We support single-payer health care as a first step toward fully socialized medicine, including public ownership of the pharmaceutical industry. Until profit is banished from health care, patients will continue battling corporations to stay healthy. Previous articleBernie vs. Hillary: What’s A Feminist To Do?